Department stores have had their problems of late, but one retailer hopes it has found a new lifeline – toys. On Thursday, J.C. Penney announced that it is planning to open toy shops in all of its physical store locations. The idea for the retailer is cashing in on nostalgia. 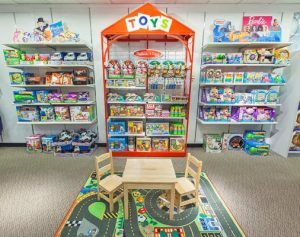 The retailer has a long history of selling toys that are much sought after in its catalogs, said an executive with the longtime retailer. J.C. Penney quietly tested its increased selection of toys in stores during last year’s holiday shopping season and the response was extremely positive for them, said the J.C. Penney executive. That led the decision to make a larger footprint in stores for toys year round. A spokesperson for J.C. Penney said that the retailer knows shoppers buy toys all year long and by creating an inviting, fun toy shop, with some of the most popular brands and hottest products families will be enticed to shop and to spend more at our stores. This announcement arrives just four months following the finalizing by the company of plans to close 138 stores, leaving it with less than 1,000 locations still open. J.C. Penney as well as a number of other brick and mortar retail establishments has been struggling trying to compete with the powerhouses of e-commerce such as Amazon and the fast fashion retailers like H&M and Forever 21, which have earned more favor from the young shoppers. The stock price at J.C. Penney has fallen 40% during the last year, but investors were apparently happy with the announcement by the retailer on Thursday as they drove up the stock price 8% during normal trading hours. Shoppers will find there will be an extensive selection of children’s toys for all ages including action figures, dolls, crafts, learning sets, racing cars and much more, a spokesperson for J.C. Penney said. Toymakers being showcased by J.C. Penney will include Mattel, Hasbro, Fisher Price and Playmobil, with common brands such as Shopkins, Hatchimals, Barbie, Hot Wheels, Star Wars and Nerf. In addition to the new toy shops in the stores, J.C. Penney said it doubled its overall online toy selection and is planning to grow that inventory more prior to the holiday shopping season of 2017.